Physiologix is a Physiotherapy centre based on the south side of Glasgow offering the very best in patient care and rehabilitation. Physiologix is run by Diane Hunter, who is a Chartered Physiotherapist and is registered with the Health Professionals Council. The Physiotherapy Clinic in Glasgow has four treatment rooms, one of which is a rehabilitation area. The physiotherapy treatment provided in the clinic are as follows: the treatment of back pain, neck pain, sport related injuries, sprains, strains and pain in any area, aches and pains related to work. Sports Massage, Advice on rehabilitation, Training and Fitness, Electrotherapy, Acupuncture, Complementary Therapies and Sports Nutrition. We also run the NSFA sports first aid course. These courses are available on request. Please contact Diane on 0141 637 7000 for details. e.g. Bupa, Standard Life, Axa PPP, Norwich Union. 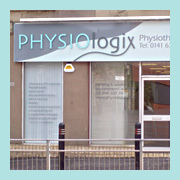 PHYSIOLOGIX PHYSIOTHERAPY CENTRE | 237 CLARKSTON ROAD, GLASGOW, SCOTLAND, G44 3DS.